HMS Kent is currently part of the UK’s standing commitment to operations in the Arabian Gulf and the Indian Ocean, at sea for weeks on end interacting with legitimate users of the sea, whilst trying to identify and apprehend those who seek to use it for more nefarious activity. On an average day the ship will conduct around a dozen Approach and Assist Visits (AAV) to dhows and medium sized ships and boats, monitoring the patterns of life, tracking hundreds of vessels and having face-to-face contact with numerous mariners. Operating 4 000 miles from home, in a region with some 20 varieties of language and a vastly different culture presents challenges that require of HMS Kent the ability to interact diplomatically and with sensitivity to local personnel. In gaining trust and empathising with the tough existence that many of these mariners endure, there is one simple currency that secures trust, breaches all barriers and which, in terms of value, makes fossil fuels and rare metals look like small change. It is, of course, water. Fresh water makes up 3% of the world’s water supply (the world supply is estimated at 1.4 billion cubic kilometres). Only 1% of freshwater is stored as groundwater and other is sourced at the earth’s surface, since approximately half a million cubic kilometres of water falls as precipitation each year and the remaining 2% is ice. According to the UN, water scarcity affects 1.2 billion people with an additional 500 million expected to reach a troublesome level of water scarcity in the coming years. It is estimated that by 2025, 1.8 billion people will experience absolute water scarcity and two thirds of the world population will live in water stressed conditions; by 2050 more than two billion people in 48 countries will lack sufficient water. When people think of a limited and valuable natural resource, one thing immediately comes to mind; oil. As a non-renewable resource, the possibility of consuming the entire existing supply of crude oil is possible and at our current rate of consumption highly probable. We all see the perception of oil echoed by the media, with conversation constantly focusing on the amount of oil reserves left and whether these reserves will eventually run out. These questions have plagued our minds since the 1970s following the emergence of “Peak Oil.” Every country, city, and individual in the world today depends on oil and the pervasive oil trade amongst countries has established it as an unofficial currency across the globe. In part that is why the military are ever present to protect the vital supply routes for this most valued of commodities. Indeed the very reason HMS Kent continues her patrols in the region is to safeguard those routes, not just by visible presence but by capacity building with the UK’s allies and by human contact with the day-to-day users of the hot and arid waterways. As the ship’s boarding teams constantly find that for all of the water they ride on, being a mariner in the Gulf is thirsty work. Elixir of Life, the Chaplain overcomes the barriers of language, culture and creed with the planets most precious commodity. Ironically, the Arabian Gulf, which is synonymous with oil, and more recently gas, is the one region where the scarcity of water arguably makes it a far more precious commodity than any other on the planet. Owing to its unusual geography tempered by high temperatures, the region is running out of accessible and affordable clean fresh water far faster than its reserves of fossil fuels. Continuous sunlight, particularly in the summer months, warms the water surface of the Gulf, causing evaporation levels to increase. The combination of both wind and solar energy leads to very high evaporation levels, especially in the shallower lagoon areas. It has been estimated that the total annual input of fresh water from the Tigris and Euphrates is less than that which evaporates from the surface of the Gulf. This in turn fails to replenish the water levels which results in natural aquifers, which took millennia to create, approaching exhaustion. While membrane osmosis technologies exist to convert sea water into fresh, they use ten times more energy than current treatment processes, a real problem if you don’t have any energy, as many third world countries don’t, and will easily double the end cost to consumers. If we consider waters use in the food chain it takes 16 pounds of grain to produce a pound of beef yet it takes a staggering 2,416 gallons of water to produce the same beef. We can survive 15 days without food, but only 5 days without water. The power of water can be seen first hand as one of HMS Kent’s high speed boats makes an approach to a dhow and offers a litre of fresh cold water, held high like a universal calling card of humanity, the reception is warm, friendly and without barriers. To every other user it’s value may not be so obvious however according to Bloomberg News, the worldwide scarcity of usable water worldwide has already made water more valuable than oil. The Bloomberg World Water Index, which tracks 11 utilities, has returned 35 percent to investors every year since 2003, compared with 29 percent for oil and gas stocks and 10 percent for the Standard & Poor’s 500 Index. The most valuable commodity in the world today and likely to remain so for much of this century, is not oil, not natural gas, not even some type of renewable energy. It is water – clean, safe, fresh water. 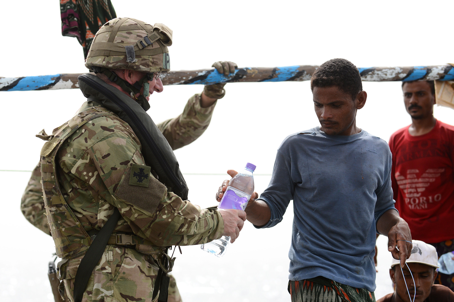 For the Royal Navy the simple gesture of gifting drinking water to break down all barriers is turning out to be one of the most powerful forms of currency in securing safe passage for our way of life.